The closest Metro stop is Farragut West Station which services the Orange, Blue and Silver lines. The 18th Street exit of the station is four blocks from the House. The K Street exit of Farragut North Station, which services the Red line, is two bocks further. There are several bus lines that stop nearby. The 80 bus comes within a block of the House and runs seven days a week. The Georgetown-Union Station Circulator and several other Metrobus lines serve stops on I street and K street, only a few blocks away. DACOR Bacon House does not have parking available to guests. There is limited parking availability for handicapped members and visitors. To request handicap parking access or assistance entering the House, contact Meg Sharley at msharley@dacorbacon.org. Street parking is available on surrounding streets. Parking meters are checked Monday through Saturday 7:00 am until 10:00 pm. You may pay for street parking by credit card. It is easiest to register with Parkmobile, which is available throughout Washington, DC. Each meter has a Parkmobile sticker with a zone number. Either use the Parkmobile App on your smart phone (this app must be downloaded) or call the number on the sticker to pay via credit card. You can also add time to your meter through Parkmobile. Please visit us.parkmobile.com for more information. DACOR has a license to serve alcoholic beverages. A licensed beverage manager must be on site whenever alcohol is served. Alcohol will not be served to anyone less than 21 years old. DACOR staff members may request government identification to verify age and will refuse service to anyone who is under age. Members and guests are expected to consume alcohol responsibly. DACOR staff may discontinue service to any member or guest. Members and their guests may bring their own alcoholic beverages for an event. All alcoholic beverages brought onto the premises by members must be sealed and presented to a bartender or kitchen staff upon arrival. Clients may also secure their own beverages for an event but they must be delivered by a beverage company, sealed, during business hours at least 24 hours before the event. Only DACOR staff may open alcoholic beverages, regardless of their origin. No opened alcoholic beverages may leave the premises. Except in preparation for events, members and clients may not store alcoholic beverages on the premises. A corkage fee of $3.00/bottle applies to all bottles brought to DACOR. DACOR maintains a professional business attire dress code in the DACOR Bacon House. While suits, ties and heels are always welcome, they are not required. For individual events, or categories of events, DACOR may apply a formal buisness attire dress code where men are expected to wear a suit or jakcet and tie, and women should wear commensurate attire. Promotional material for these events will specify that formal business attire is regquired. Jeans of any kind, T-shirts, sneakers, running shoes, and flip flops are never permitted. Silent, handheld electronic devices (including tablets) may be used discreetly throughout DACOR premises. Cell phones may be used for talking in a manner that does not disturb the enjoyment of other members. Phones should be set to silent or vibrate in all DACOR programs and events. Calls should generally be made or received only in the hallways, cloakrooms, and courtyard. Members, guests and clients who take photographs or videos of people at events held at DACOR should remember not to publicize these materials on print or electronic media without first ensuring that they have the permission of the individuals whose images they have captured. DACOR routinely takes photos at its events for use in print and electronic communications. Members and guests should notify the DACOR photographer if they want to restrict the use of their names and images. Employees do not receive gratuities directly from members or guests. However, members are encouraged to make contributions to the Employee Holiday Gratuity Fund at any time. Members and guests shall not reprimand an employee. Complaints should be made to the employee’s supervisor, the Director of Operations, or the Executive Director, preferably in writing. Employees are not permitted to leave the House on errands for members or guests. Minors are permitted on DACOR premises only when accompanied by a member or other adult family member. News media, bloggers, and other publicists shall not be admitted to DACOR premises for reporting purposes without prior written approval from an officer or the Executive Director. Similarly, no interviews or other information shall be given by anyone to any news media, bloggers, and other publicists without prior written approval from an officer or the Executive Director. The only exception to this policy is the President, who may give interviews or information to the media, as circumstances warrant, without prior written approval. DACOR members who are professional journalists or representatives of the news media shall refrain from collecting or sourcing information for use in their work while on the premises without prior written approval from an officer or the Executive Director. Such members may at any other time request interviews with another member, including on-the-record interviews. DACOR does not accept responsibility for personal or other property in the cloak rooms, coat racks, guest rooms, or any other part of its premises. DACOR may dispose of, as abandoned property, articles left for more than 90 days. Only service dogs are permitted on DACOR premises. Additional cleaning fees may be charged, as necessary. 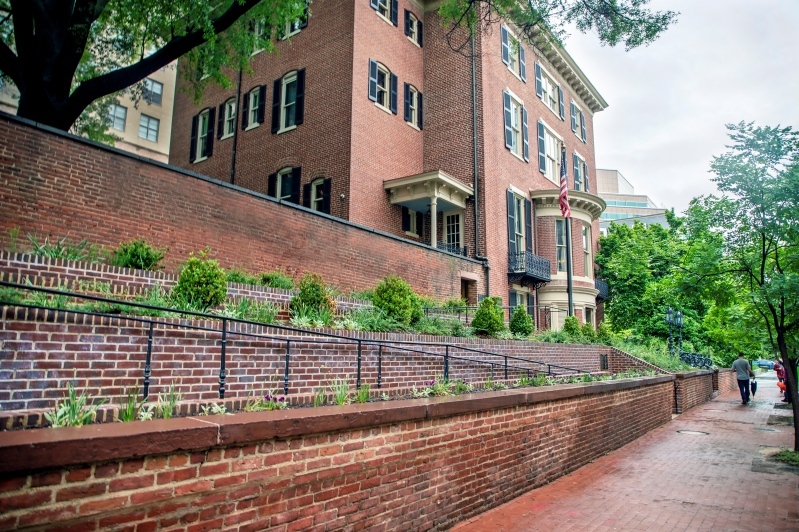 In accordance with District of Columbia law, and in the interest of preserving our historic House, smoking (including e-cigarettes) is not permitted on DACOR premises. Is the House handicap accessible? The House features a ramp from the F Street sidewalk to a business door. The interior of the House is serviced by a handicap accessible elevator. We have limited handicapped parking, which must be arranged ahead of time. To request assistance with accessing the House or parking please contact Meg Sharley at msharley@dacorbacon.org. What is the weather closing policy? If the federal government shuts down due to inclement weather, DACOR is closed and all scheduled programs and private events for the day are cancelled. If the federal government is on a two-hour delay, all programs and private events beginning before noon are cancelled. Programs and events beginning at noon or after will take place unchanged. If the federal government is open or is operating on liberal leave, DACOR is open and all programs and events will take place unchanged. The federal government’s closing information can be found at the OPM website. Yes. The password to access the visitor wifi is available on-site. Can I host an event if I am not a member? You must be a member or be sponsored by a member to host a private event at the DACOR Bacon House; however, non-members may host weddings at the House. For more details or to discuss how to find a member to sponsor your event, please contact Meg Sharley at msharley@dacorbacon.org. What are the program attendance, reservation and cancellation policies for members and guests? Apart from member lunches, noontime programs require a reservation. Programs at other times, including in the evening, may request or require a reservation. The cost of different types of programs varies and can be found under the event announcement. In the case of any event for which there is a charge, no-shows and cancellations not received by 9:00 AM the day before the event will be billed unless another cancellation policy is indicated when your reservation is confirmed. The deadline for making reservations to attend programs is 9:00 am the day before the event. Walk-ins will be permitted at the discretion of staff based on attendance and logistical factors. DACOR encourages vigorous expression and questioning of points of view, while striving for balance. No endorsement of speakers’ views or of their charitable, professional, or commercial bona fides should be inferred. Members are expected to respect any restrictions the program committee and/or speaker place(s) on the use of information discussed during DACOR programs. To facilitate candid discussion, DACOR does not invite media to its programs. Members may bring guests to programs or social events that are open to all members and for which they pay a fee unless otherwise indicated. Members must accompany their guests, make reservations for them, and pay for them, including no-shows who do not cancel on time. The guest is the member’s house guest or has in-depth experience that will be useful to the dialog. The member makes reservations for both the member and guest. The member pays a fee, now $25, for each guest, including no-shows who do not cancel on time. For A-100 Receptions, the House is not at full capacity. Members must acquaint personal guests and participants in their sponsored events, in advance, of the rules pertaining to conduct at DACOR, including those governing appropriate attire, use of electronic devices, and the public treatment of program content. Members are responsible to ensure that their guests comply with all House Rules. Do I have to make a reservation for Members’ Lunch? No, reservations are not required for the Tuesday and Thursday Members’ Lunches, unless you would like to reserve a table. However, if you plan on bringing more than four guests with you, advance notice is helpful to our staff. How do I access the Members’ Portal? Only members have access to this feature of the website. If you are a member and need assistance logging in, please contact DACOR directly.